Striped button-downs are so much more versatile than people give them credit for. They’re the perfect shirt for work or play, depending on how you style them, and we’re going to show you how to do it both ways. Today, we have a playfully-perfect day out. Our Convertible Sleeve Button-Down Blouse is the perfect option whether you’re at your 9-5 or enjoying your weekend. With a lightly flared asymmetric bottom and a flattering collar you can wear open or closed, you can count on this shirt to be one of your new favorites. While you can wear this shirt any time of year, we’re beyond ready for spring so we made the perfect spring day outfit for walking around our favorite city. 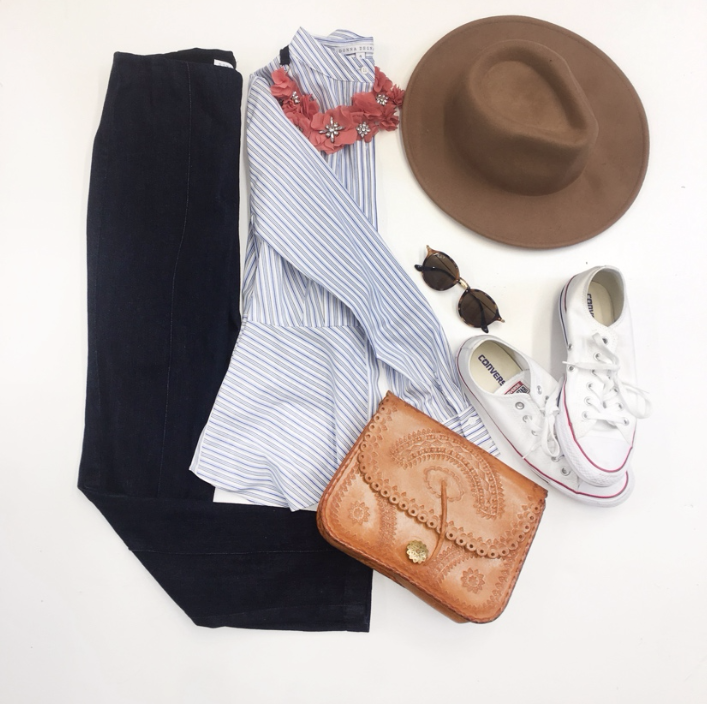 Dark wash, slim-leg pants are the perfect pair for this top: they won’t overwhelm the delicate stripes and will balance the slight peplum of the top. These are our Pin-Tuck Skinny Jeans and they have the most comfortable stretch waistband, perfect for a long day of walking. your look. Grab your go-to bag and you’re ready to go! How would you style our Convertible Sleeve Buttondown Blouse?